Should you invest in Wells Fargo (WFC)? In order to identify attractively valued dividend stocks, I follow a monthly screening process, where I go through the list of dividend champions and dividend achievers to look for bargains. In addition, I often stumble upon quality income stocks during my review of the dividend raises for the week or on an ad hoc basis through interactions with other dividend investors. Some investors that I know have been purchasing Wells Fargo (WFC), which is one of the best run large banks in the country. The most prominent buyer of Wells Fargo is Warren Buffett, who has been accumulating the stock for the past four – five years in his personal portfolio and for Berkshire Hathaway (BRK.B). Buffett finds that the key competitive advantage for Wells Fargo is its low cost of funds. The bank took out 25 billion from TARP, and as a result had to slash its dividend and acquire Wachovia. I had heard only great things about Wells Fargo, which increased my interest in the bank. As a result, I took a look at the financials over the past years. The financial included Wachovia since 2009. The thing that I noticed was that there was no growth over past four years in revenues. The amounts from non-interest fees have held steady, while the net interest revenues have decreased slightly. Since 2009 however, expenses have decreased from $70.688 billion all the way to $57.615 billion in 2012. The main driver behind the decrease in expenses was due to decrease in the Provision for credit losses from $21.668 billion in 2009 all the way to $7.217 billion in 2012. At the same time earnings per share increased from $1.75 in 2009 to $3.36 in 2012, while annual dividends increased from 49 cents/share to 88 cents/share. The forward annual dividend payment is $1.20/share. Wells Fargo also increased the number of shares each year since 2009 to 5.351 billion. Since the main reason behind growth has been the reduction in the Provision for credit losses, it seems that future growth would be limited, unless the company either earned more from loans or more from fees. Actually, net interest income has been declining, while the amount of loans has been slightly up from $783 billion in 2009 to $800 billion in 2012. Securities available for sale have increased dramatically however to $235 billion, up from $173 billion in 2009. At the same time, deposits have increased from $781 billion to $946 billion. The main problem behind lending these days is that it is much tougher to loan money, and interest rates are dropping at the loan rate level. At the deposit rate level, interest rates are essentially zero. As a result, in order to compensate for the decrease in the net interest rate margins, Wells Fargo would have to ramp up its lending. With interest rates projected to be low for the next three years, increasing lending will be the only way out to profit growth in this segment, without sacrificing credit quality however. The issue with ramping up credit right now however is that when interest rates go up in five - seven years, Wells Fargo might end up owning assets such as 30 year loans at 4% ( I made this number up), when its cost of capital is close to or above 4%. The mitigating factor however is that the average maturity of loans is under 30 years, and also a portion of Wells Fargo’s loans are floating rate. The company will have almost $300 billion in loans mature within the next five years. Over half of these loans were floating rate ones. New loans will generate more income however. I like the fact that the company also has a substantial amount of non interest based revenues, which account for half of Wells Fargo’s revenues. 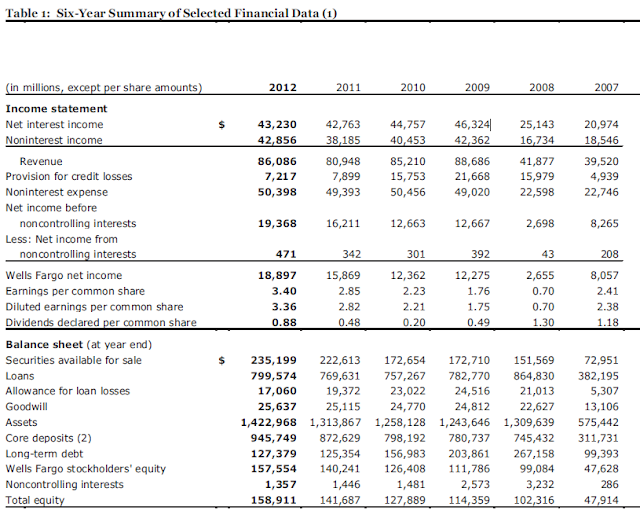 Total trust and investment fees and total mortgage activities accounted for over half of those non-interest revenues. The portion of fee income is approximately 59%, with the rest derived from mortgage origination, other, insurance and gains from trading. It is good to hear that the company is able to generate diverse income streams to fall back on. The company is able to cross-sell products to customers who enjoy their banking relationship with it. One positive could be that the company has a record $945 billion in deposits, and has attracted over $200 billion since 2008. While not all of the funds are allocated to loans, this could be a good indicator going forward, because it means more banking relationships over time. A customer can open a checking account today, then decide to take a mortgage, open a brokerage account or do other business with Wells Fargo. The customer relationship piece is an intangible part of the business, but nevertheless could yield dividends down the road. In addition, with record low interest rates, these deposits are almost not costing anything to Wells Fargo. Overall I like the fact that Wells Fargo is trading at 10.80 times earnings, yields over 3% and has a sustainable dividend payment. The company has a solid asset base, which will pay dividends for years. However, I am not certain where future growth will come from. The increase in the company’s profit since 2009 has been mostly due to the reduction in the provision for loan losses. At the same time revenues have been flat. Unfortunately, a company cannot grow shareholder value without growing revenues. You can only cut so much expenses. If Wells Fargo were to start loaning out more funds, it would possibly translate into more revenue, as long as borrower quality is maintained and the net interest margin does not drop from here. There is a margin of safety in today’s valuation, but until I can see revenues increasing, I am going to sit this one out on the sidelines. At the same time, I am a big fan of the five largest Canadian banks. These companies have a dominant position in the Canadian market, and earn very good amount of fees from customers. At the same time they have been able to grow interest and non-interest income, increase number of branches and expand by buying US bank assets. Back in early 2013 I purchased shares in Bank of Montreal (BMO), Bank of Nova Scotia (BNS), Royal Bank of Canada (RY), Toronto-Dominion Bank (TD), Canadian Imperial Bank of Commerce (CM). Of course, if Canada’s housing market softens, these big five banks would likely perform worse than the likes of Wells Fargo. The table above shows the Net Interest and Non Interest Income trends for Toronto - Dominion Bank (TD). It also shows the trends in the provision for credit losses as well. Canada adopted IFRS accounting standards recently, which is why information for prior to 2011 is under Canadian GAAP. Either way however, the trend in the three pieces of information would be similar under both accounting methods. The trend over the past few years in both interest and non-interest income for the big five Canadian banks is positive. They have been expanding domestically and internationally, which makes seeing where growth will come much easier. Are we in a REIT bubble?